Nepali Movies made on popular books and stories. Will Summer Love be successful? Parijat’s novel ‘Sirishko Phool‘ was one of the best novel in the history of Nepali literature. The award winning novel was made into a movie by a Japanese director. But, the movie version of the book flopped. Last year, a movie titled ‘Seto Bagh‘ was released. The movie was made on the story of a very popular novel by Diamond Shumsher JBR ‘Seto Bagh’. The movie however couldn’t re-create the charms of the literary work and flopped miserably. A TV serial of the same book was also shot at the time of the movie. I have no information on the fate of the TV serial. Writer Karna Shakya wrote a book titled ‘Pal‘ and then made it into a movie by the same name. The book was fairly popular but, the movie wasn’t much successful. A Gopal Prasad Mainali’s very popular book ‘Masan‘ was also made into a movie by the same name. The art movie also didn’t come anywhere near the popularity of the book. Krishna Dharabashi’s story ‘Jhola‘ was also made into a movie and released in 2014. The movie was successful in winning the top actress award in SAARC Film Festival and was also a commercial success. Those were some of the latest Nepali movie made on well known books and stories by well known literary figures. Apart from ‘Jhola’ no other movies were successful. Now, another book – ‘Summer Love’ is being made into a movie. The questions are being raised if the film makers could justify the story of the book or not. Although the team is credible and the artists look promising, we would need to wait till the release to know if it will be as successful as the book itself. Festival seasons are the most preferred time of the release of Nepali movies in theatre. Because of the popularity of online release, these days, the film producers have also started releasing movies online on festival season. On this Tihar, five new movies were released online and I have shared them in separate posts. It is very interesting that each of the movie has uniqueness to look out for. The movie ‘Nai Nabhannu La 4’ was a superhit movie like it’s previous sequels. The movie is worth a watch. A short film ‘Bhai Tika’ is exclusive online. The movie features Miss Nepal 2012, Shristi Shrestha in leading role. The short and simple movie is about Bhai Tika. It is worth a watch for everybody who has a brother or a sister. Why was Raghav released in internet instead of theaters? The Raj Ballav Koirala‘s film ‘Raghav’ surprised everybody by releasing it in the internet instead of in theaters like other movies. Every other Nepali movies wait at least a year before releasing in YouTube. In that time they try to make the required profit from theaters and DVD sales. Releasing in YouTube is relatively a new trend and there are some producer still skeptical in releasing their films in internet. When ‘Raghav’ broke the tradition, a lot of Nepali film industry were surprised and some were even scared of the new development. They want to try a different approach in distribution of movies. Targeted audience of ‘Raghav’ is not Nepali theater audience but Nepali students in international institutions. The film has already recouped the investment and the YouTube version does not earn any revenue. Before releasing for free 500 copies of the film were sold. The Nepali movie ‘Manjari’ makers have accused a journalist of blackmailing for advertisement. In a Facebook statement, the director of Tuka Entertainment, Ganesh Dev Pandey accused an online magazine FilmyZoom of asking for money. When the film makers refused to give the money, the journalist had threatened of starting negative publicity of the movie. In an attempt to defame the movie, a review was published stating that the movie will flop. The prediction wasn’t based on any facts but because the movie named after a female name. At the time of this writing, the article is already removed, but there is a Facebook share, showing a portion of the article in the website’s Facebook page. Chapali Height – copy paste poster again! The poster of Chapali Height released yesterday are copied from an Michael Douglas’s English movie Basic Instinct. It’s not only the poster, the name also has a similar design. It’s not only the poster, the name of the movie is also inspired by the movie. With these similarities, it’s anybody’s guess what the story should be like! 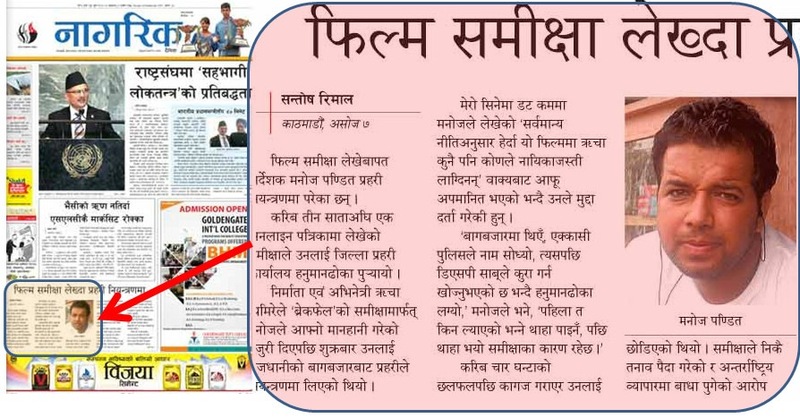 There is no rule as far as release of movies in Nepal is concerned. Even if there are any rules, they are broken every now and then. The so called "queue system" in itself is flawed that good movies take ages to be released in Kathmandu while others get released within weeks it is finished. Manoj Pandit wrote a review of Richa Ghimire‘s movie Brakefail. He wrote – "Richa didn’t look like an heroine in the movie," and published it in a website. Richa got angry, and complained to the police, who arrested Manoj. He admitted his "mistake" in getting personal about the actress. Nagarik published the issue and it was made public. In the article, Richa claimed that the website, Merocinema, wrote the negative review because of the fact that she refused to provide an advertisement to it. She also told, only NJA designated journalists should write movie reviews – all others should only write positive things. A movie released out of Kathmandu some three years ago has finally got it’s turn to be screened in Kathmandu. Last time I was surprised to see the movie,Chodi Gaya Paap Lagla taking 2 years to reach Kathmandu theaters. Silsila broke the record! You can watch Silsila by clicking here. Nepali movie "Chodi Gaya Paap Lagla" was released today in Kathmandu. Outside valley, the movie was released around Dashain of 2066 (almost 2 years ago), that was in Hetauda. Why did it take the movie to travel from Hetauda to Kathmandu? You might think, "May be the movie was so bad that people in Kathmandu wouldn’t like it." Not true! It had won 7 National awards. Nepali Movies – confusing names – is Nepali language poor? What? Didn’t I see this movie last year? But, the names are not always same, they are similar! It is not only the name that is similar; thanks to the limited supply of artists, they usually have the same actor and actresses. Many get confused and prefer not to visit theaters to watch "similar" movies.